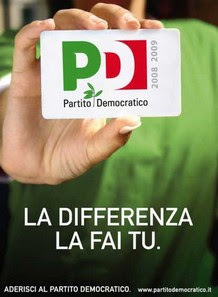 Italy Democratic Party voters, who are you? Aside from the chitchat, after the 2010 regional elections the Italian Democratic Party lost 4 regions: Campania, Calabria, Piemonte and Lazio. PD has lost without any misunderstanding. Although Berlusconi and his fourth government have once again made everything to give reasons for any opposition worthy of this name to convince people not to vote for them, the Democratic Party has lost. That’s not new and there are many theories about it. No, I’m serious: who are you really? Many call you Centre Left people, but it’s a convention, isn’t it? Well, because you are not on Centre. In Lazio your candidate was Emma Bonino. Tell me now how a Centre person – that here means Catholic - may vote for a Radical politician. You are not even on the Left. Let's be honest once and for all. Being Left means too many things not appropriate for you. A Leftist cannot vote a party where recently had among its ranks scary characters like Mrs. Binetti. Some of you might argue that she’s gone, but there are always people in the organizing committee as Rosy Bindi and Lamberto Dini, naming two. Come on, show a bit of sincerity. Dini! Is Dini on left?! Someone else might respond speaking of coalitions, strategic alliances, Centre Right on the one hand and Centre Left on the other. The Italian Centre Right is Right, it's just Right, there is no Centre there, do you want to see it once and for all? The Right-wing voters vote the Right people, but who did you vote for? Who if you are neither the Centre nor the Left? Now don’t try to say that you’re those who want to dismiss Berlusconi as it would be the most tragicomic lie in Italian history. Do you really think that until now Democratic Party really wanted to make a law to combat the abuses of our prime minister?! If they wanted it, they would have done! Even a child could understand this. So you're not alternative to Silvio Berlusconi. You’re not, if you vote Pd. Well, you are not the Centre, you are not Left nor Right, and you do not really want to stop Berlusconi. Perhaps you are an invention of the newspapers or TV. Who doesn’t exist cannot change things. The News: Bersani says to Berlusconi: "We are ready for real reforms."